Nocturnal moths, such as the tobacco hawkmoth Manduca sexta, rely on their extremely sensitive sense of smell in order to locate their food sources: flowers that contain nectar. After energy-uptake, female insects lay their eggs. Although the moths drink the nectar of flowers growing on different plant species, their larvae thrive only on the leaves of plants from the nightshade family, such as tobacco. Additionally, female moths also find the best host plants for their offspring via olfactory cues. A team of researchers from the Department of Evolutionary Neuroethology, led by Sonja Bisch-Knaden, has investigated whether neural activity patterns linked to either feeding or egg-laying behavior can already be observed in the antennal lobe, which is the first processing level of scents in the insect brain. The scientists analyzed the responses of the olfactory center of the moths to 80 different plant odors that are important for Manduca sexta in the moths' natural environment. They measured the concentration of calcium ions in the nerve cells to visualize their activity when a moth was stimulated with an odor. Identifying which olfactory glomeruli became active in response to different odors was the goal. Olfactory glomeruli, spherical structures in the antennal lobe of insects, are considered the primary subunits of the olfactory center. When the antenna of a moth is stimulated by an odor, an odor-specific pattern is activated. Such patterns are similar in all moths of the same species. "By using diagnostic odors to stimulate each single moth in our test series, we established a functional atlas of the antennal lobe. 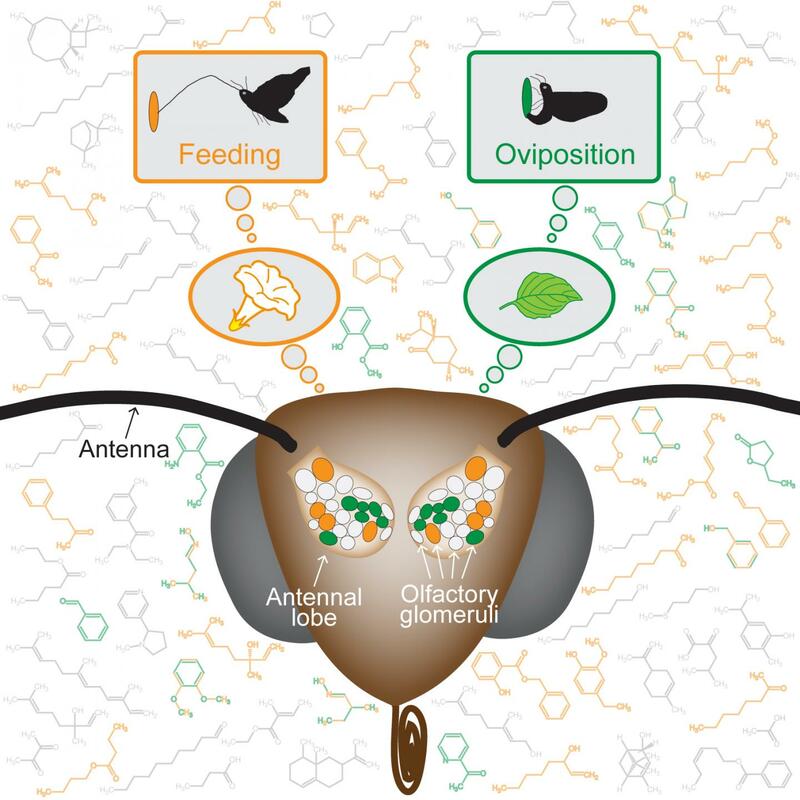 We were able to address two-thirds of the visible olfactory glomeruli in each animal and then study the moths' responses to a large set of odors," explained Sonja Bisch-Knaden. Next, the researchers tested the 80 odors in behavioral experiments with female Manduca moths; using a wind tunnel, they compared neural activity patterns in the moths' brains in response to certain odors to the attractiveness of the same odors in behavioral assays. The insects are attracted to odors that had been applied on filter paper and, depending on the odor, unroll their proboscis and try to drink nectar or bend their abdomen and lay eggs on the paper. What the scientists observed was astounding: "We had not expected that a single chemical compound could be as attractive to hungry moths in search for food as would be a complex flower bouquet. We tested hungry virgin females in an assay with white filter paper and reckoned that they would only extend their proboscis to search for food. It was pretty fascinating that a few odors also caused virgin females to lay their eggs on the filter paper, which obviously had not been fertilized," Sonja Bisch-Knaden summarized. Comparing behavior (feeding or egg-laying) to the activity patterns in the antennal lobe reveals that activity in specific brain areas correlates with one of the behaviors. The activity level of certain glomeruli determines whether female moths extend their proboscis to feed or whether they try to grab the paper with their feet and curl their abdomen to lay eggs. "It is, rather, the activation level of single glomeruli which is decisive for the behavior of the moth. Obviously, when an odor is processed in the insect's brain, a decision is made at a very early stage which behavior is triggered by this odor," said co-author Bill S. Hansson. In their natural habitat, Manduca sexta, a moth species found throughout North and South America, feeds on a variety of nectar-producing flowers. Typical moth flowers are light-colored and strongly scented, allowing hungry moths to find them easily in the dark. The offspring of Manduca sexta, however, survive on only a few host plant species, such as tobacco. The odor of a host plant provides crucial olfactory cues. Because a habitat may contain related moth species that use the same flowers as nectar sources but different host plants to lay their eggs, the researchers would like to investigate whether odors that provide olfactory cues to identify the best oviposition sites activate similar areas in the antennal lobe of these moths, or whether the functional atlas of the brain is different in each species.